Glowlab is pleased to present the writings of Los Angeles independent curator Chris Balaschak, who recently produced the Itineraries exhibition at Gallery Luisotti in Santa Monica. The following text accompanied the exhibition, and we are publishing it in three parts. Included below is the final segment; here is part one, and here is part two. 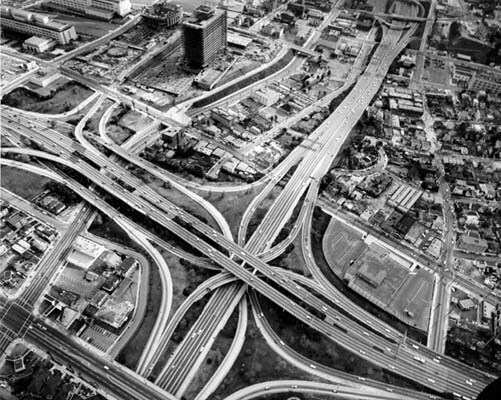 There is a section of freeway in Los Angeles that is the "superfreeway" Reyner Banham once predicted [i]. The superfreeway is that freeway only accessible from the freeway itself, a site that transcends the actuality of the city's endless grid - so distant from its time and its space. The particular slice of freeway that I speak of was only recently completed in the 1990s (it starred, unfinished, in the movie Speed). Furthermore this superfreeway is accessible only to the congregation of individual bodies, the carpool, that here directly interchanges personal perceptions of greater Los Angeles across its commute space. It is in the diamond lane of the 105 freeway heading East away from the beach and LAX, that the commuter can transition to the 110 North, heading toward downtown Los Angeles on a semicircular overpass above a grand stratification of freeway and city street below, and underneath LAX flight patterns. At its height this transition road, on a clear day, offers an expansive overview of greater Los Angeles - from oceans to mountains to valleys. Still, the perspective of this view does not offer a distinct point from which to encompass the city. Moving, often near 70-80 miles per hour, the view of the city rises with the overpass, and sinks beneath the horizon of guardrails once the short duration of this event passes. I have often been on this superfreeway making a commute that becomes a regular part of my schedule come the summer months, the migration from Los Feliz to the beach at El Porto and back again. In the return trip to Los Feliz I jettison atop this overpass as if coming up for air from the fluid city below. Even from this high vantage point, one cannot perceive the entirety of the city. The commuting body and the city are in constant motion against one another. Greater Los Angeles spreads ever outward past the horizon into a haze of fog and debris filled air. Though one can quickly glimpse downtown from this site, or the Hollywood sign (so small from this vantage point), the movement and the one-way perspective of the overpass undermine any ability to wholly distinguish a singularity of city beyond my linear narrative through it. The times of such commutes are as unpredictable as the space of the city is incomprehensible. To know and describe greater Los Angeles is a process of commuting; that motion across its surface that can be traced for others, as its form is based on the individual narrative motions of many rather than a single objective and determined perspective. Early in his reconnaissance for the book Los Angeles: The Architecture of Four Ecologies, Sunset Boulevard baffled Reyner Banham. Traveling into the city along the Pacific Coast Highway, Banham passed a sign for Sunset Boulevard and asked himself "could there be two parts of Greater Los Angeles with Sunset Boulevards, or did the same boulevard run through the various parts of town and, if so, which part did I need?" The confused Banham then realized greater Los Angeles as "totally incomprehensible," one would suspect due to his, previously mentioned, familiarity with the European model of a city. It was as if Banham was stuck in the fluid web, he had nothing to grasp onto and no definite points with which to align himself. Instead Banham was left with lines that could be traversed without a central point of focus. Despite this confusion, Banham was impressed by the linearity of the city and the possibility of its new order of urban form. The distances of movements and lines traversing the city, a space of multiple nodes as intersections that distinctly lacked a central focal point was summed up in this statement: "Los Angeles makes nonsense of itself when it tries to see itself in terms of concepts borrowed from other cities, such as 'downtown.' The unique value of Los Angeles - what excites, intrigues, and sometimes repels me - is that it offers a radical alternative to almost every urban concept" [ii]. Banham would later go on to cite Wilshire Boulevard as "the first linear downtown" [iii]. Such a downtown - and today Wilshire Boulevard's Miracle Mile is far from a focus of cultural or economic interchange - is only perceivable through the linear movement through it - far from the focal, discrete intersections of Benjamin's Paris or Banham's London. In Los Angeles seemingly all intersections are not only similar but equivalent, central monuments are here replaced with linearity. Greater Los Angeles' better known tourist attraction, the Hollywood Walk of Fame, is in itself a monument to the movements of individual experience. Like Banham's citing of Wilshire, Ruscha cites Sunset in recognition of the linear nature of the city and its actuality as a place of linear movement rather than the centricity of a single point. Los Angeles uniquely lacks such focus, though it has long welcomed civic plans, turned comedies of error, to transpose a central downtown into the city. In a longstanding history (most recently in a building by Frank Gehry), civic officials plan to site downtown upon Bunker Hill - these plans have been unraveling themselves since the 1940s [iv]. However Ruscha's Sunset Strip and Banham's Miracle Mile were and are (in the case of Sunset) more commonly held as downtowns to Los Angeles, places to which a mass of population intersects on a regular basis. Even so the uniqueness of these spaces is that they do not allow for a stable perspective from which one can experience the whole space. Instead Wilshire and Sunset are lines that must be traversed and commuted upon in order to describe the site. One cruises back and forth on the Strip, but does no rest at a single point from which the entirety of Sunset can be realized. This is the actuality of greater Los Angeles as a commute space, present in the many possible "downtowns" it has unveiled, downtowns that are lines rather than points, spaces of movement rather than stability. This ongoing, and odd, revisionism to create some sort of downtown, some center upon Bunker Hill specifically, seems antithetical to greater Los Angeles, a space built on linearity, movement, and freedom (freeway) from the panoptical centricity typical of what Banham has called the "standard city" [v]. Instead greater Los Angeles should revel in the commute-space that it has created, a place of vast and infinite cities created by individual narratives, and the itinerant exchange such complexity recognizes. While Ed Ruscha calls it "nothing," Richard Sennett refers to the common landscape of a commute-laden city as "neutral." Sennett states, "this general principle we now see realized in cities given over to the claims of traffic and rapid individual movement, cities filled with neutral spaces, cities which have succumbed to the dominant value of circulation" [vi]. The common landscape, at the collective level, is a neutral zone - it resists any label that can attach through complete consensus. This landscape is a space where the opposing poles of beginning and end are converging creating equivalence, a common public space, common only to the individual and alien to the collective. As a commute space greater Los Angeles exists neutrally, an equivalent plane where variant movements can exist and create the city without opposition (such as that created between distinguishing center and periphery). Neither public nor private, the roadways of greater Los Angeles are this fluid and indefinite form without such polarity. The infinitude of lines in the city possess unlimited recollections of pasts, and possible futures, for movements through the space of the city, though no single line defines the form of the city. Greater Los Angeles, a web of variant individuals intersecting in their linear progression between stable points is mutable and constantly shifting. As greater Los Angeles cannot be defined through its multitude of natural topographies - mountains, desert, beaches, grassland - it is an aggregate of disparate identity to which each commute creates its own city. The common landscape of greater Los Angeles is extant in its multifarious private perceptions; held in common to the city is the uncommon actuality between individual experiences. In exchanging the itineraries of individual movements - such as that in the Spider Survey or Ruscha's book - greater Los Angeles is realized as a commute space built upon a horizontal plane; a space of liberated individual experience without a dominant singular vision of the city. These commutes, across superfreeways, over Spider Cities and through Sunset Strips and Boulevards, redefine the greater Los Angeles commute, and the city itself as a space defining by such movement. Commuting, in its common usage, is the movement between two points (often home and work), repeated on a regular basis. Though the common parlance today is suggestive of postwar suburban white flight, where people lived distant from the city center and moved inward on a daily basis to their workplace, this is in fact the most recent redefining of the term commute. Commuting in this present incarnation has its roots in rail travel, in the commutation ticket. The commutation ticket would be purchased to account for any number of roundtrip travels on a given route, sold at a discounted price. Of course these still exist with the incarnation of the Metro Card or Bus Pass that is purchased by regular travelers on public transportation. Yet this is only a single root of the word commute. The original, or proper, definition is to denote exchange. Currently associated with the chemical movement between molecular bodies in molecular sciences, this usage of commute as an exchange is an apt fusion of the individualized perspective of the city created through the single linear movement and the web of these lines left as itineraries interchanged between individuals. In light of the Spider Survey and Ruscha's books, a more intriguing definition of commute engages us, that which denotes both a back and forth movement as well as the exchange inherent in tracing this space as itineraries. Though the Spider Survey and the Sunset Strip both are a method of mapping the city, they each become map through a system of exchange between individuals. Without exchange from one to another, these maps of a city fraught with itineraries does not exist. When individual commutes are recorded and become itineraries, a second commute of exchange opens itself. These itineraries can commute between individuals, a sharing of experiences of the city, of other possible cities within the web of greater Los Angeles. The case of the Survey reveals the exchange at the level of individual contributing to a larger map they will then share in, that of the greater Los Angeles spider population. Ruscha records his experience of the Sunset Strip and unfolds that movement, this back and forth commute space, for others to read. Greater Los Angeles is susceptible to many mappings, moving beyond the arbitrary structure of road maps such as the Thomas Guide that attempt and fail to frame a geography that is in constant mutation. The exchange of the commuting body from one to another through the itineraries they have traced opens up the multitude of cities that are realized, reenacted and anticipated in the web of greater Los Angeles. In exchange certain lines and interchanges become reinforced through their constant usage, and this constant traversal on certain lines creates the tensile strength of the web. Such reinforced itineraries, like those of the superfreeway, Ruscha's Strip, or the Spider Survey's map, do not create complete coherence of the city but rather contribute to the complex whole. These especially tensile lines are more common commutes, yet they accent the role of individual movement in the creation and definition of the city's complex urban geography. In the indefinite fluidity of greater Los Angeles, where millions of linear commutes crisscross in creating the web of the city, the city does not have form without intersection and exchange. Implicating the fluidity of a world in constant movement, Edouard Glissant has referred to this contemporary state of individualism as internal exile. "Internal exile," Glissant writes, "strikes individuals living where solutions concerning the relationship of a community to its surroundings are not, or at least not yet, consented to by this community as a whole" [vii]. The individual body is far from exilic upon its own path, yet in relation to other paths and itineraries the individual body remains distant. To a collective common we each are in exile but within the commute of the individual, and its exchange with others, a more definite root to place is formed. In the share of these narrative lines defining the city, such exile is released as the individual realizes other cities to be experienced upon similar, and perhaps divergent, paths through the city. Between the poles of the collective and the individual, the public and the private, is where the complexity, and not the chaos, of the greater Los Angeles is divulged. Instead of a postmodern chaos that lacks center, greater Los Angeles moves away from such issues into a new order of linearity. Individual lines reveal past movements while becoming future cities to experience. Such interweaving is crucial to the urban web maintaining itself as fluid and amoebic while also composed and textured. The web of greater Los Angeles is the array of lines left by others, unfamiliar to one's own, inviting new paths and perspective across a common landscape. It is in the intersection of lines that relations become exchanges of disparate individual experiences. These are the sites from which stable community spreads. As there are many lines there are equally as many exchanges and communities expanding throughout the city. Greater Los Angeles is reliant on this foundation where lines become definitive relations to the city. This spider's web hangs between disparate surfaces and has a complex geometry of incalculable measure, maintaining an unpredictable form created by the aggregation of simple lines [viii]. Greater Los Angeles relies on the exchange of individual itinerant movements, these simple lines, to create a web where other possible routes - into pasts and into futures - can be trafficked between commuting bodies. The diverse communities and individuals of greater Los Angeles intersect through these exchanges of potential cities to be experienced. Such commuting leads to the fluidity of the city, its polymorphic form, exemplified in the naturally occurring capricious lines of tidal ebb and flow upon greater Los Angeles' beach or the hidden fault lines that turn the earth to liquid and continually reshape the topography of the area. Greater Los Angeles is this web stretching between the disparate topographies of beach, mountain, desert, and grassland, that, like the spider's web, holds any number of possible traversals between disparate points over a topographical substructure. The strength of this web is apparent in the exchanges, the intersections of its infinite number of lines, that hold together and mutually conceive the itinerant geography of greater Los Angeles. [i] Banham's future vision describes "the Superfreeway, with access only from the existing freeways" as becoming the next layer of the transportation palimpsest. Banham, Los Angeles, 72. [ii] Reyner Banham, "Encounter with Sunset Boulevard," The Listener 80, no. 2056 (Thursday 22 August 1968): 236. [iii] Banham, Los Angeles, 69. [iv] There are innumerable sources that delve deeply into the reasoning for this lost center of the city and the lineage of Bunker Hill's equation into recreating a center, but this is not the subject of this paper. 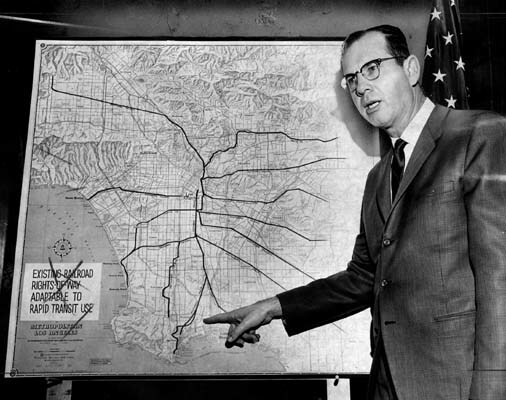 Mike Davis' City of Quartz and David Brodsly's L.A. Freeway are two excellent materials that can begin the reader on the path of opening up the complex history of Bunker Hill and Los Angeles' lack of downtown. There is also the common myth that the actual pueblo site from which Los Angeles spread, a center perhaps, has long been lost to time, only to be transplanted onto the tourist-oriented site of Olvera Street. Rather than dwell on the debates of center/periphery, which seems a tired postmodern discourse continually beaten to death by the likes of postmodern geography gurus previously mentioned, a new order that recognizes the inherent loss of the issue of centricity, and the welcoming of the linear instead of the radial, is more apt to the questions of Los Angeles' geographical mystery and "confusion" as Banham has called it. [v] "The cities of the Old World and the eastern United States run very much to a pattern - you don't realize how standardized they are beneath their much vaunted individualities, until you come up against somewhere like Los Angeles." Banham "Encounter with Sunset..." 236. [vii] Édouard Glissant, trans. Betsy Wing, Poetics of Relation (Ann Arbor: The University of Michigan Press, 1997) 19. [viii] There is no definite predictability to a spider's web. A web is created for each spatial parameter. Even the common orb web, a circle with radiating lines, reveals a complex of varying sticky and non-sticky threads, differing distances between threads, and is far from rudimentary or geometrically calculable. A good source, and not too technical, for contemporary debates on web form is Samuel Zschokke, "Form and Function of the Orb-Web," European Arachnology 2000, (2002) pp. 99-106.